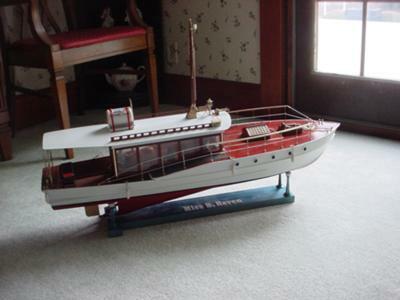 After building the bridge deck cruiser, "Lady Alice", I wanted to attack the 1920-1930's era again. I began looking for a likely candidate on the internet and again came up with a composite design of my own, based on 3 that I had found. 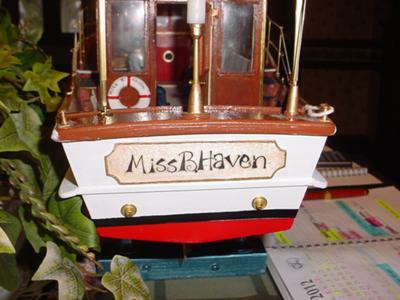 She is the scratch built, except for the hull, "Miss B. Haven". 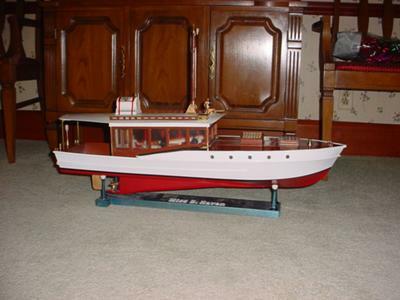 I purchased the hull, a fiberglass PT boat hull, from a fellow modeler in Michigan and began the transformation. 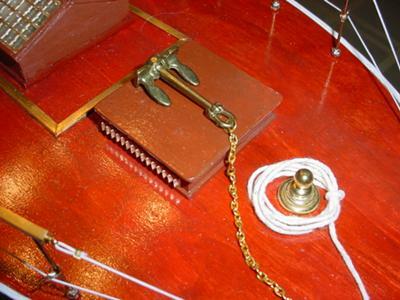 Again, the cabin interior is highly detailed, sporting a table, 2 occasional chairs, a small table, built-in refrigerator, storage drawers, a gaucho (couch) and of course, the helm. The crew is comprised of a father, mother, twin boys and the family dog. The cabin door is operable. The mast can be lowered for clearance. She has a 4 channel radio sytem for forward/reverse, steering, speed, running lights and cabin lights. The pictures show only a crew of 3, the 4th plus dog, only added recently. She has only been bath tub tested, since my "in home" business keeps me quite busy. Hopefully, I will launch sometime soon at a local park.